A unique 200-metre-high Sky Walk is the latest tourist attraction set to open in Dubai. The observation corridor will be located in The Address Sky View development in Downtown Dubai. But it’s not for the faint hearted with visitors required to wear safety harnesses to experience breathtaking views of Dubai as they walk outside of the building. The 30-metre-long cantilevered Sky Walk, which is fixed to the structure of one of the two Address Sky View towers, is a half-oval structure with a total walking distance of 45 metres. 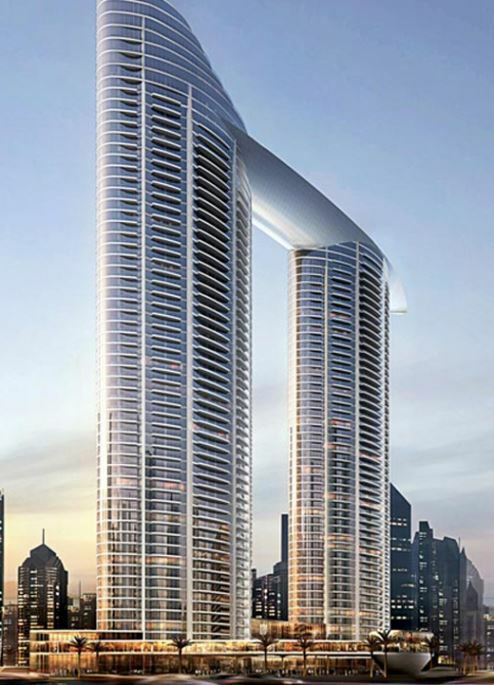 The Address Sky View is a residential and hospitality project that also features the 85-metre-long Sky Bridge, which at 220 metres high, boasts duplex apartments, a 70-metre-long infinity pool and other amenities. Commenting on the project, Mohamed Alabbar, chairman of the developer behind Sky Walk, said: “Address Sky View is one of the prestigious upcoming developments in Downtown Dubai that not only features a world-class hotel and serviced residences, but also the iconic Sky Bridge and now a new Sky Walk. The international team working on the project has addressed several design challenges due to the extensive loads of steel used to build the Sky Walk, which were impacted by temperature fluctuations. They introduced several innovative approaches for the on-schedule progress of Sky Walk construction, according to Alabbar.